No, there’s still no word on when we will see the Tata Tigor EV on Indian roads. Tata Motors has once again shown signs of wanting to drive towards an electric future. 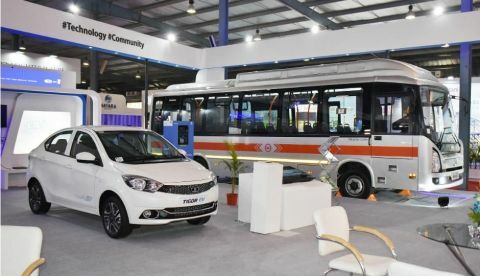 The Indian car maker showcased the Tigor EV and the Starbus Ultra 9m electric bus yesterday at the Vibrant Gujarat Summit 2019 in Gandhinagar, Gujarat. The Tata Tigor is a petrol- and diesel-powered compact sedan that currently sells in the Indian car market at starting price of 5.2 lakh rupees. The Tigor EV is an all-electric version of the same that Tata is yet to launch in the consumer market. According to a press release by Tata Motors, the Starbus Ultra is a 9-metre-long passenger bus whose all-electric powertrain was designed and developed by Tata. The bus has been designed for urban transportation that’s free of noise and emissions. There’s no word yet on when the new electric bus will make it to Indian roads. Tata has not yet revealed details about the motor and the battery that power the new Starbus Ultra. Tata agreed to supply 250 units of the Tata Tigor EV to the Energy Efficiency Services Ltd. (EESL) back in December 2017. When it reported the news, the Indian automotive giant announced that the first batch of Tigor EVs had already been manufactured. Since then, there has been no word from Tata on the consumer availability of the Tigor EV or how much it will cost. When it finally goes on sale, it will compete against the commercially available eVERITO, Mahindra’s EV sedan that sells for around 9 lakh rupees and has a claimed range of 140 kilometres on a single charge. which is the best Net Connector Tata photon or any other? I want to purchase a cdma phone for my tata sim card please suggest me a best smart phone .